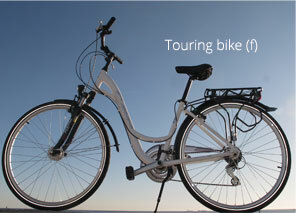 BARCELONA BY BIKE was founded by the active holiday specialist NATUR BIKE S.L. NATUR BIKE S.L. has been running tours throughout Spain, Morocco, Cuba and South East Asia since 1997. As a Barcelona based agency Naturbike S.L. 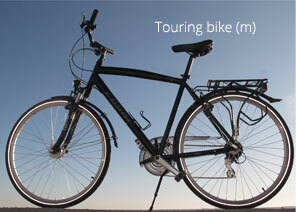 set up BARCELONA BY BIKE in 2008 to run bike tours in and around the city of Barcelona. Over the past ten years cycling has become a popular means of transport not only for the locals but also for many visitors of Barcelona. Considering the growing numbers of cyclists and the need for sustainable transport and tourism, the local government invested in the extension of the bicycle infrastructure. Today, Barcelona has a network of over 200 km cycle lanes with many more being planned. Our Barcelona by Bike guides have one thing in common - their passion for Barcelona: for its people, its culture and its past and present history. Most of us have lived here for years and gained a great deal of insider knowledge. We will be delighted to help you with any further information you may need for your stay in Barcelona. And very important – our guides are multilingual. We can provide tours in the following languages: English, Spanish, Catalan, German, French, Dutch, Italian and Russian. 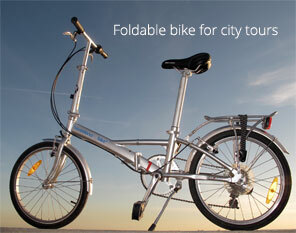 For our City Tours we provide foldable bikes with 5 gears or Minivelos with back-pedal break. Both types can be adjusted to suit all sizes, from 9-year-olds (1.40 metres) to basketball players (2 metres). For the more challenging rides we use 24-gear touring bikes in different frame sizes (male and female frames available) and equipped with front suspension. Every tour starts with a quick adjustment of handlebars and saddle to your preferred riding position. All bikes are serviced regularly and have a bag rack to save you having to carry your day bag across your shoulders. There is no obligation to wear a helmet on Barcelona's streets. Nevertheless we do recommend using one and have some available for hire. Please book in advance.